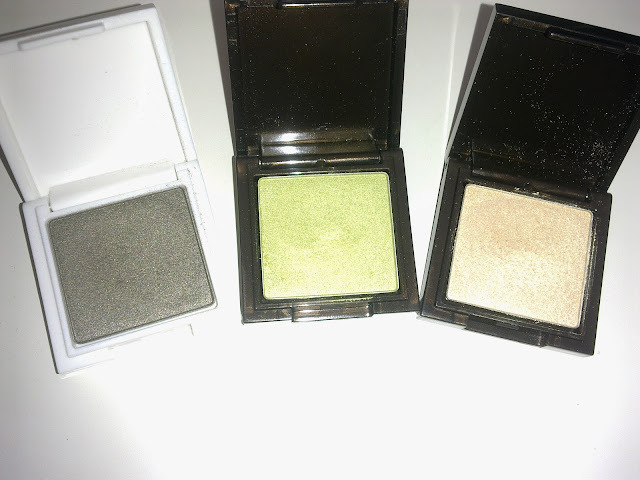 I won this eyeshadows from the giveaway held by Irene of Blushingloves not too long ago. 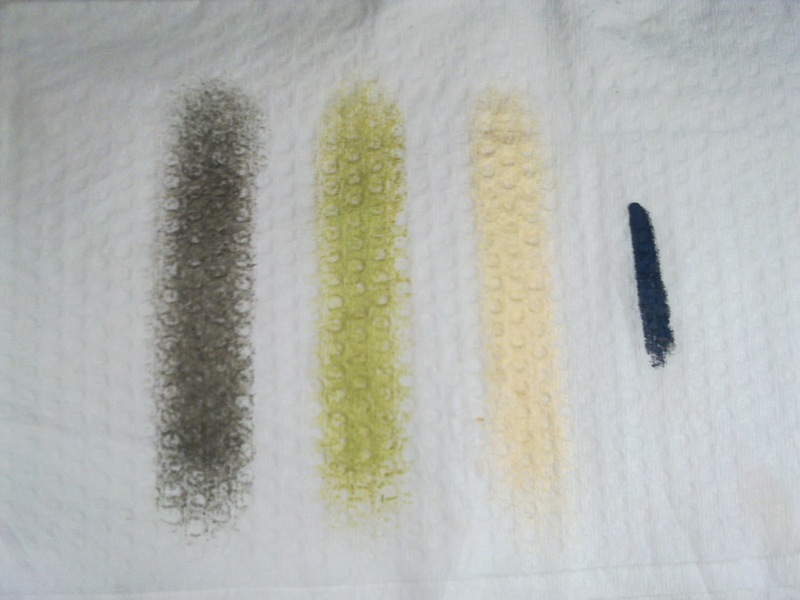 Been wanting to swatch this for u guys but I had been rather caught up with my personal life. Anyway I think my phone camera did not really capture the colors as well in this post (I freaking struggled for an hour or so just to get these pathetic pictures). But for the time being, I hope u guys will bear with me for now till I get a new camera (I'm planning to update all the previous posts where the swatches were just horrible). I've been saving up $$ for it and also somehow the model that I wanted is out of stock every freaking shop I go. 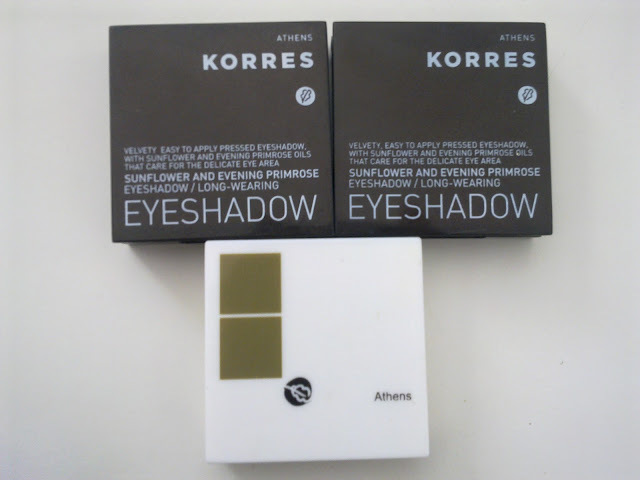 The products which I won are from the Korres and this is my very first time trying their line of products. 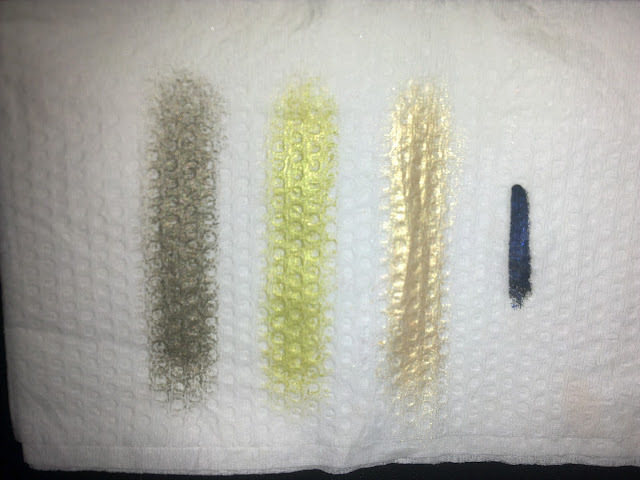 The ones in the dark brown/black packaging are the Sunflower and Evening Primrose Eyeshadows while the one in the white packaging is the Shimmering Eyeshadow. The colors that I got were Lime, Golden and Olive Green (Great color selection Irene! I love the combination). 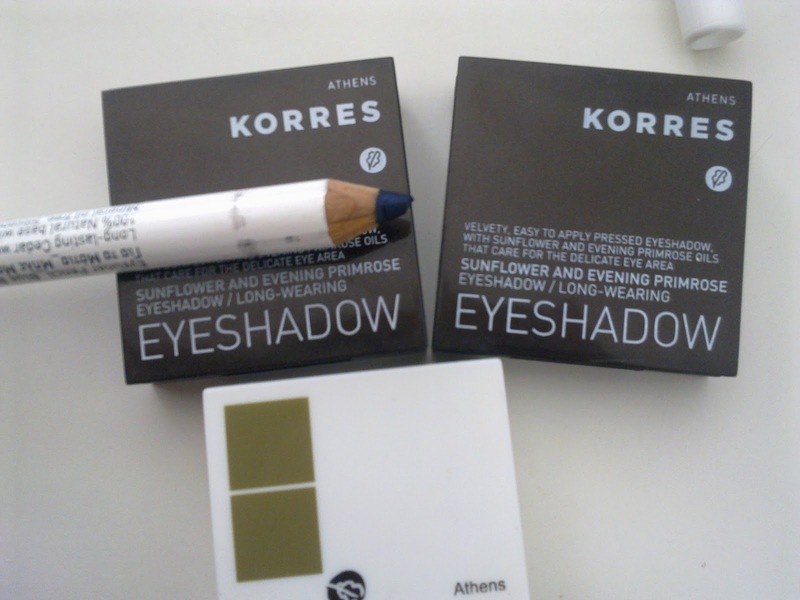 The prize also included a Korres Eyeliner Pencil in Blue Black. 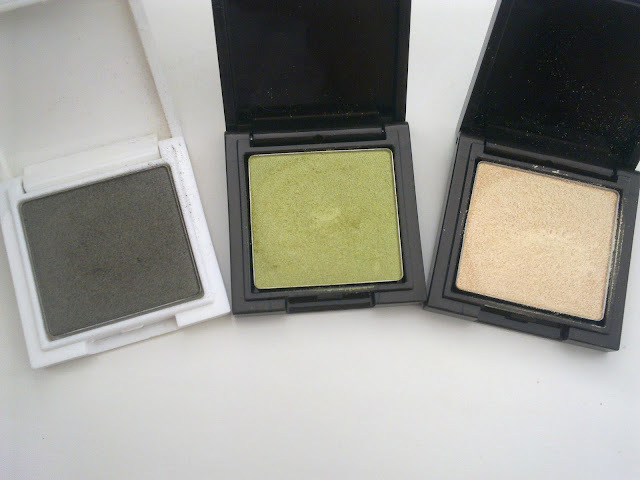 Korres claim that these are velvety and easy to apply pressed eyeshadows and I couldn't agree more to it. Apart from being pigmented, I love how smoothly and evenly these eyeshadows glides on my skin and best of all they are natural products (Mineral Oil and Propylene Glycol Free)! The eyeliner (love the metallic blue black shade) is also extremely soft and creamy and said to contain herbs and vitamins(Impressive!!). So creamy that I always nick the product whenever I don't pay attention while putting the cap on. If asked about how I think these compared to Urban Decay's eyeshadows, I would say the Urban Decay's shadows are more pigmented and color selections are wider, brighter and bolder. 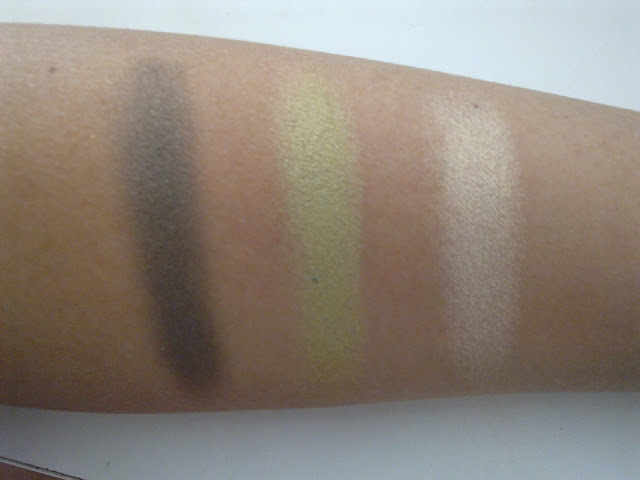 However, texture wise I feel that they are less velvety and less soft as compared to the Korres eyeshadows. I definitely recommend those who are looking for natural products and some everyday eye colors to check out these eyeshadows. I'm not too sure about the price and where to buy this since I won this from a giveaway but I believe you can find them at Sephora. For more product information, u can check on their website here. wish i can get my hands on korres makeup and skincare <3!! Rinny- Glad that we share the same sentiments. I am loving the texture. Hello popcorn! Those are my favs as well! Thanks for dropping by and leaving a comment! I've always wanted to try out Korres makeup. Thanks for taking such good pictures of the swatches. Seriously, the swatches look amazing. I have a horrible camera and I know how you feel. Mara- Haha...Thanks for the comment babe! Hope I'll be able to get a new camera really soon. Am crossing my fingers.. glad that u liked the swatches..